hd00:23Tractor spray fertilize green field with pesticide insecticide herbicide chemicals in agriculture field in evening sunlight. Farmer care plants. hd00:12Farm tractor close pulling a cutter harvesting alfalfa Lucerne hay for livestock and cattle food. Cutting the green crop by an old tractor. hd00:17Farm where alfalfa hay is being cut by a tractor and swather. Tractor towards view. Bright green crop and dry hills in background. Butterflies flying. hd00:12The mown grass is flying everywhere around. 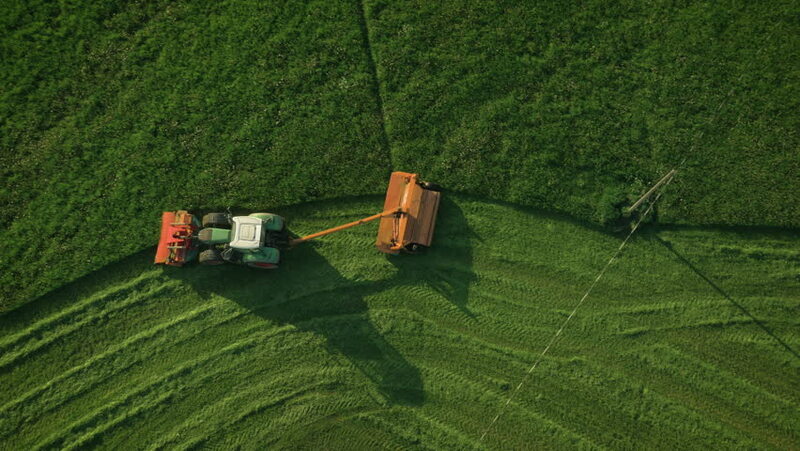 A farmer is driving a tractor and pulling a machine which is attached to it.